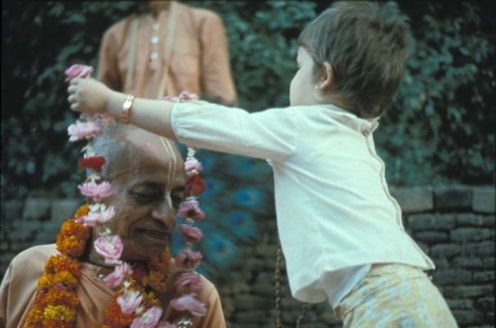 At their first meeting, Srila Prabhupada received the instructions that would inspire him to bring about a spiritual revolution in the world. "You are an educated man. Why don't you preach Lord Caitanya’s message throughout the whole world! Krishna consciousness is so important that it cannot wait." Later on when the Krishna consciousness movement began to grow he always credited all his success to this statement by his spiritual master. 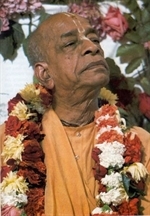 In 1944 Srila Prabhupada founded Back to Godhead magazine. Using his own money and working with no assistants, he wrote, edited, proofread, printed and distributed the magazine in northern Bharat alone. 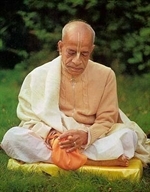 In September 1959 Srila Prabhupada took the vow of renunciation from the famous scholar Srila Kesava Maharaj in Mathura and was given the name A. C. Bhaktivedanta Swami. 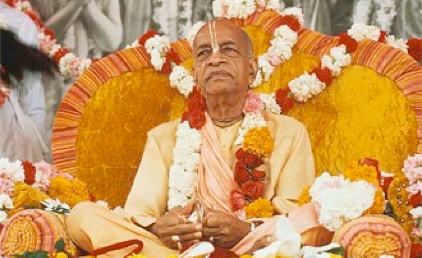 Depending fully on Lord Krishna’s mercy, Srila Prabhupada began a monumental literary project – the production of an elaborately annotated English translation of the Srimad Bhagavatam. 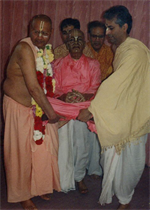 After completing the first volume, he presented a copy to the then prime minister of Bharat, Lal Bahadur Shastri, who appreciated Srila Prabhupada’s scholarly work. 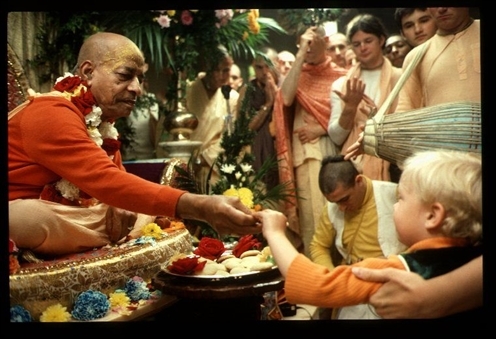 In 1965, at the age of sixty-nine, Srila Prabhupada left Bharat (India) with a crate of his Srimad Bhagavatam and forty rupees and embarked on the historic journey to the West on board the cargo ship Jaladuta. He entered the world’s largest city at the time, New York, and eventually moved to a small storefront at 26 Second Avenue, where he held regular daily programmes. Within months he attracted many followers and opened centres in San Francisco, Montreal, Boston, Los Angeles and Buffalo. Srila Prabhupada established farming communities, introduced a vedic gurukula system of education and inspired the opening of several major international cultural centres in Mumbai, Vrindavan and Mayapur in Bharat. He was constantly travelling, making no less than fourteen world tours in twelve years and at the same time he never stopped writing and translating. Srila Prabhupada initiated and inspired more than five thousand disciples and established 108 temples throughout the world. More than eighty of his books have been published in over forty languages and more than 500 million books have been distributed worldwide. These transcendental books include Bhagavad Gita As It Is (1968), Teachings of Lord Caitanya (1968), Krishna, the Supreme Personality of Godhead (1970), The Nectar of Devotion (1970), the seventeen volume Sri Caitanya Caritamrta (1973 – 1975) and thirty volume Srimad Bhagavatam (1962 – 1977).